Another great tasty dish from my Peruvian friend Jorge. Papas a la Huancaína is a famous traditional dish made by women from the town in Huancoyo, Peru. Boiled potatoes are topped with a rich, creamy and slightly spicy cheese sauce and usually, it is served either cold or at room temperature as a starter or side dish. This sauce is versatile, it can be used as a dipping sauce for shrimps. 1. In a small skillet, heat 1 tbsp oil over medium-high heat, add garlic and chili peppers, until garlic turns lightly brown. 2. 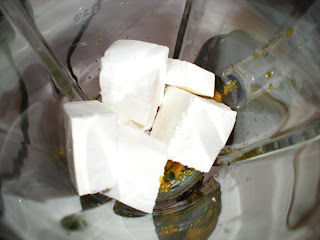 In a blender, add cooked garlic and chili peppers, cheese, oil until smooth. 3. 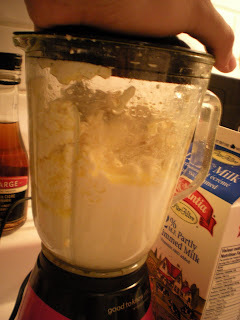 If mixture is not soft after blending, add milk until smooth. 4. 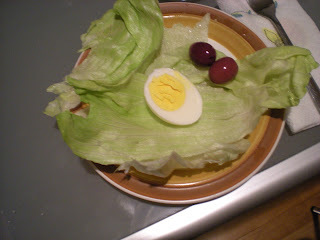 As a tradition, assemble lettuce leaves on a small plate. 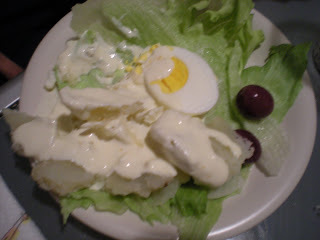 Lay half hardboiled eggs, two olives and potato slices on top. Pour sauce over potatoes and lettuce. Those potatoes look delicious! I have a good friend from Peru and her food is wonderful.